Australian Bodycare Hair Clean Shampoo with 2% tea tree deeply cleanses the scalp and hair removing residues of hair syling products and other impurities without stripping the hair of it's moisture. With antifungal and antiseptic properties Australian Bodycare shampoo inhibits the growth of unwanted bacteria helping scalp problems. Nourishing oils and glycerine apply moisture reducing the itching associated with a dry scalp. Hair will feel soft, clean and well cared for. Australian Bodycare shampoo may also help in the treatment of head lice. Soothes and treats the scalp. Contains natural Tea Tree Oil to repair and protect. Apply Australian Bodycare Tea Tree Oil Intensive Cleansing Shampoo to wet hair, massage well into the hair and scalp and leave to work for 1 minutes. Rinse thoroughly. 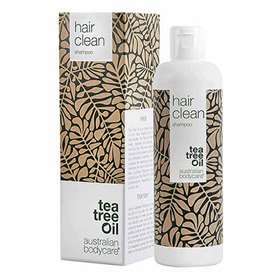 Follow with Australian Bodycare Tea Tree Hair Care Conditioner 250ml. Aqua, Sodium Laureth Sulfate, Cocamidopropyl Betaine, Glycerin, Melaleuca Alternifolia Leaf Oil (2%) Sodium Chloride, PEG-7, Glyceryl Cocoate, PEG-7 Rapeseedamide, Sodium Cocamphoacetate, Hydroxypropyl Guar Hydroxypropyltrimonium Chloride, PEG-4, Distearyl Ether, Distearyl Ether, Dicaprylyl Ether, Citric Acis, Phenoxyethanol, Potassium Sorbate, Sodium Benzoate, Limonene, Linalool.